Sunshine and s’mores — a match made in heaven! 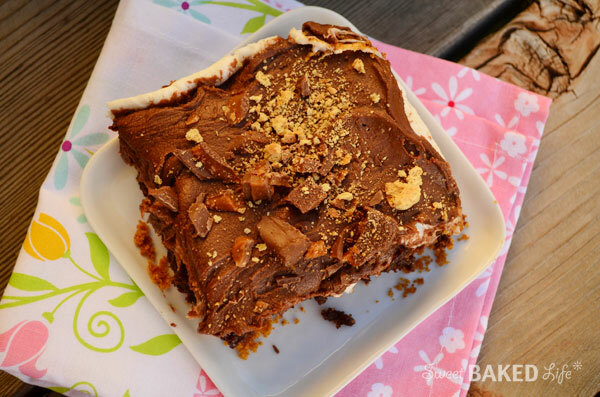 And with the sun still shining around here, now is the perfect time to whip up a batch of these decadent Frosted S’mores Brownies to celebrate the end of the wonderful summer season! Please note, I was given The Frosting Queens – Charmed Chocolate buttercream frosting product free to review. The recipe, photos and opinions are 100% my own. And even better, keep the sunshine alive as you indulge in these sweet morsels any time of the year! I actually made these a bit earlier this summer and had been waiting for the perfect time to share this great recipe with you, and now that time has come! 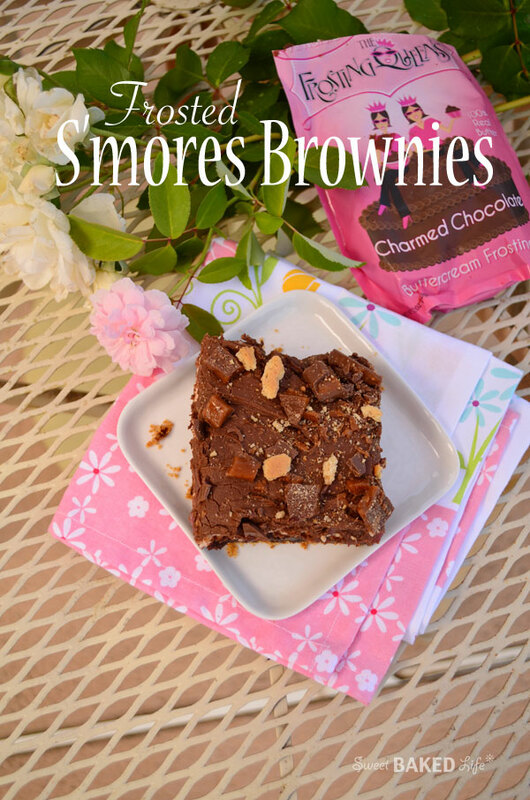 Just thinking about the incredible flavor combination of these delectable Frosted S’mores Brownies instantly puts a smile on my face. Leave it to a s’mores recipe to do that! With s’mores being one of my all time favorite sweet treats, I decided to make a truly decadent version… I began by making a graham cracker crust, then added rich milk chocolate brownies swirled with chopped Skor bars, then a layer of gently melted and gooey marshmallows and topped them with creamy Charmed Chocolate buttercream frosting and finished with a sprinkling of Skor bar bits and coarsely chopped graham crackers! Nothing could be more perfect! Heat oven to 350 degrees. Spray a 13×9-inch pan with cooking spray and set aside. In a small bowl add the graham cracker crumbs, sugar and butter. Pour into the prepared pan and press on the bottom until even. Mix the brownies according to the package directions. Add two of the chopped Skor bars and gently combine. Pour the mixture over the crumb crust and smooth with the back of a spatula. Bake according to box instructions. Mine took about 30 minutes. When the brownies are done, pull out of the oven and immediately top with the marshmallows. Put back into the oven for about 5 minutes or until the marshmallows are soft, but not browned. Let cool completely on a wire rack (this part may be hard to do — my husband and son wanted to gobble them up immediately at this stage). When cool, gently knead the pouch of frosting, cut open, and squeeze out over the marshmallows. Gently spread the frosting until even with a spatula. Sprinkle the top with the remaining Skor candy bits and the chopped graham crackers. The end result was amazing. And the frosting — I was impressed! Not only do The Frosting Queens use all-natural ingredients, including real butter, the frosting is also gluten-free. The instructions were clear and the frosting was easy to work with. The Charmed Chocolate buttercream frosting tasted really good — it was rich, creamy and not overly sweet. When I was getting ready to frost my brownies, my son was immediately at the kitchen counter with a spoon in hand wanting to try a bit of the silky chocolate from the cute pink pouch. Well, guess what, after one small bite, he wanted to eat the entire pouch! It really does taste homemade! The Frosting Queens reign in Sacramento and you can find them in 300 specialty food store locations in over 30 states. In the Sacramento Area, check them out at Whole Foods and Corti Bros. As well, you can purchase the frosting online! Their flavors include: Velvety Vanilla, Charmed Chocolate, Crowned Caramel and Striking Strawberry — yum! 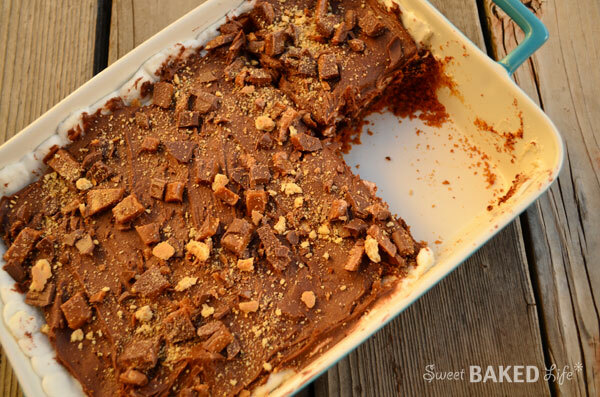 So even though we are just about to say “so long ” to summer, be sure to keep the ray of sun beaming in your life as you share these Frosted S’mores Brownies with your family and friends! Go ahead, make someone happy today with some sweet sunshine!